I wasn’t going to do this, but what the hell, as long as I’ve got the material in front of me, let’s take one last dip into the crazy-pond. The pond of which I speak is the chaos and craziness at Marvel in the mid-70s. Specifically, I’m talking about the Enforcer storyline that ran from Ghost Rider #22-24. At the time of the storyline, Johnny Blaze was working as a stuntman for the “Stunt-Master” television show produced by Delanzy Studios. The supporting cast during this period included George Smith (Stunt-Master), Karen Page, studio security guards Gus Utermohle & Denny Armstrong, director (and former actor in some old Western movies) “Coot” Collier, studio head Charles L. Delazny, and Roxanne Simpson. 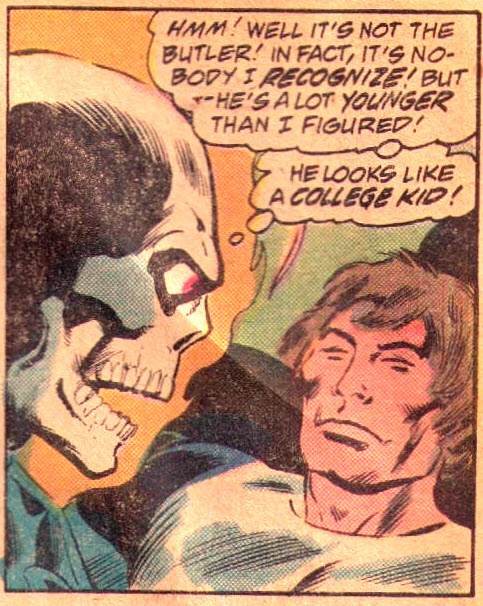 Ghost Rider #22 (Feb. 1977), written by Gerry Conway (story) and Don Glut (script), introduced both the Enforcer and Carson Collier (Coot’s son) to the strip. The Enforcer is a super-villain, natch, while Carson is a new supporting character, returning home to his father, Coot, after some length of time away. Now I don’t believe the Enforcer’s identity was ever meant to be a big mystery. Most of the super-villains of this era were your garden-variety crooks, with little to no character development, and simply there to trade punches with the superhero(es). Half the time you’d get little to no background on them at all; other times you might get a one-page flashback offering the most basic origin story. As far as Carson Collier, I’m guessing his problems were the beginning of an unrelated subplot—something sinister in all likelihood, based on the hints dropped in the text. So Carson is involved in some kind of dirty business and he shows up in the same issue as the Enforcer… seems an easy enough leap to conclude that he and the Enforcer are one and the same man. Except for this: One page before we meet Carson, we see the Enforcer taking over the local mob. When the next page switches scenes to the Collier home, the text reads, “Even as his newly acquired gang rather nervously rallies about the triumphant Enforcer– there is activity elsewhere.” This would imply that the scene of Coot and Carson’s reunion is taking place at nearly the exact same time that the Enforcer is taking over the mob. So unless being in two places at once is one of the Enforcer’s super powers, he can’t be Carson. Carson does not even appear in the strip again, though there is a scene in Ghost Rider #23 (Apr. 1977, now written by Jim Shooter), where George and Rocky voice concerns to Johnny about Coot’s recent behavior. I think it’s safe to assume this odd behavior was supposed to be connected with his son Carson’s arrival the previous issue, but the subplot will be left dangling and we’ll never know for certain. 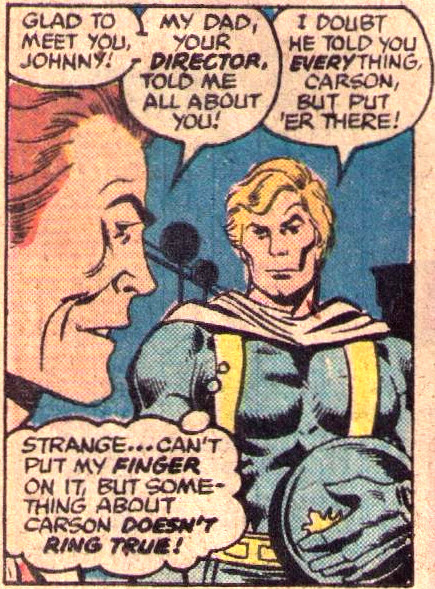 Carson was introduced to the book by Gerry Conway, but this was during Conway’s ill-fated, one-month foray as editor-in-chief, so he didn’t stick around long enough to finish what he started. It looks like Shooter was trying to pick up the plot thread here and do something with it, but he either forgot about it or simply gave up on it after this issue. Ghost Rider #24 (June 1977, again by Jim Shooter), will wrap up the Enforcer storyline, but will still only give us hints as to the Enforcer’s true identity without revealing anything definitively. At one point, as the Enforcer disintegrates a garage with his ring, he remarks to Charles Delazny, “Your son is in college now, isn’t he? It would be too bad if his young life were cut short!” Then he says: “That motorcycle in your garage– your son’s, right? I’m taking it!” The Enforcer seems to know an awful lot about Delanzy’s son, no? This is clearly meant to tell us something. Then, after his defeat at the end of the issue, the Enforcer is unmasked. It’s such a generic face that it’s easy to mistake the guy for Carson Collier if you’re not paying close attention to the text. But Johnny/GR met Carson back in issue #22, so he would have recognized him if this was the case. Plus there’s that line, “looks like a college kid”—it was pretty well established earlier in this same issue that Charles Delazny had a son in college at the time. If one were to read this story in a vacuum, uninfluenced by any stories that came before or after, the logical conclusion would seem to be that the Enforcer must be Delazny’s college-aged son. Unfortunately, there’s no follow-up on this in the next issue. We then get confirmation in Ghost Rider #26 (Oct. 1977, written by Shooter), but this is done in a very offhand, blink-and-you’ll-miss-it manner. Thanks to Dr. Druid reading Charles Delazny’s mind, we now know the Enforcer was Delazny’s son—but this is told, not shown, and he’s never even given a name. And the Carson Collier subplot is never even mentioned again, let alone resolved. If you were reading this without paying strict attention, the mistaken conclusion that Carson was the Enforcer is easily reached. Even if you picked up on the truth, a writer/editor could decide that given the circumstances—that definitive confirmation of the Enforcer’s identity was never really shown and the Carson Collier subplot was left dangling—it might simply be neater business to say Carson was really the Enforcer all along, thereby tying up everything. And perhaps this is what happened when Michael Fleisher brought the character back in Spider-Woman #27 (June 1980). In the story, sleazy newspaper publisher Rupert Dockery visits California State Prison to see a “long-time resident” named Carson Collier, aka the Enforcer. This is the only time the Enforcer’s true name is mentioned in the three-issue storyline, but that’s all that’s necessary to make a mess of things. Let me note that the Enforcer previously fought Spider-Woman in Spider-Woman #19 (Oct. 1979, written by Mark Gruenwald), but his secret identity was never a plot point in the tale, so no damage done. Ditto for a later appearance in Ghost Rider #58 (July 1981; again by Fleisher). Years later, the Enforcer was killed off by the “Scourge of the Underworld.” Captain America then catches up with the Scourge in the pages of Captain America #320 (Aug. 1986), where it is revealed that the Scourge was apparently the Enforcer’s brother. (The Scourge’s true identity gets even more complicated by the end of the issue, but let’s stick to the mess at hand.) After being captured, the Scourge gives us a one-page info dump explaining everything. Notice how writer Mark Gruenwald chooses his words. No names are mentioned. Scourge says his (and the Enforcer’s) father “was a famous Hollywood director” that “specialized in Westerns.” Coot Collier was an actor in old Westerns, not a film director (he became a director of television shows later on), while Charles Delazny was the studio head/owner. Though I suppose it’s not impossible Delazny could have dabbled in directing in his younger days, this would seem unusual and unlikely. Since no names are dropped, the Enforcer (and the Scourge) could be the son(s) of either man. I suspect the way it was written was purposely meant to leave the door open for either possibility, but this just serves to muddy the waters even more. Really, there are only two ways out of this, and they both involve admitting to mistakes. 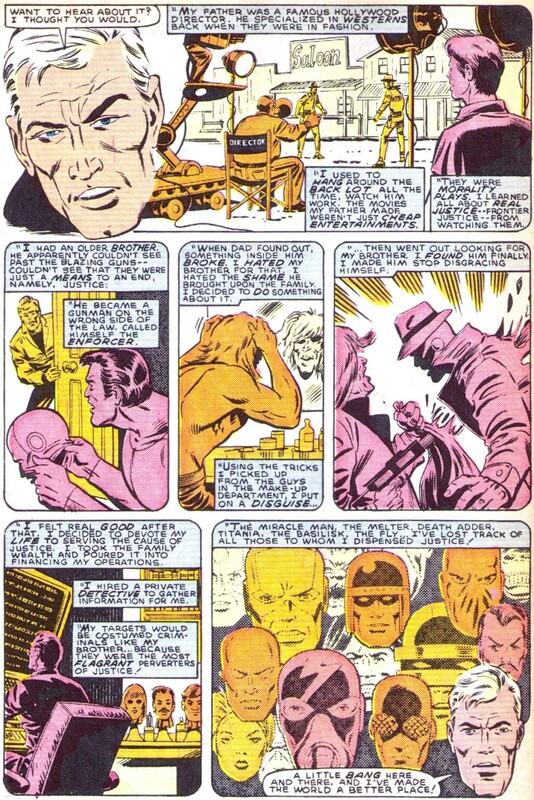 Either the Enforcer was Carson Collier, in which case Johnny simply didn’t remember/recognize his face when he unmasked him; the text marking the transition between the first appearances of the Enforcer and Carson in issue #22 was wrong (it would need to be changed to “hours later,” or “the next day,” or something like that); and Dr. Druid somehow misread Charles L. Delazny’s mind in GR #26. Or the Enforcer was Delazny’s son, in which case he was simply misidentified in the text of Spider-Woman #27. This also means we’ll never know what was really up with Carson Collier, but this is hardly a big deal. Charles L. Delazny, Jr. was born in San Jose, California. He is a criminal mercenary and son of Charles L. Delazny Jr. [NOTE: They obviously meant Sr. here] who owned Delazny studios. Beginning a criminal career, he employs an elderly scientist named Dr. Ignatz Goldman, who designs Charles’ costume. Charles then takes on the costumed identity of the Enforcer. So we finally have a name: Charles L. Delazny, Jr. Not very original, but we’ll take whatever we can get at this stage, right? Enforcer manages to recover before the authorities arrive. In his civilian form, Enforcer convinces the authorities that Carson Collier Jr. was the Enforcer, causing Carson to be arrested for Enforcer’s crimes. Charles Delazny Sr. soon figures out that his own son is the Enforcer. Right. Because it’s that easy. Commit a crime, accuse someone else, they go to jail instead of you. And Carson is also a junior, apparently. (“Coot” was never a proper name, now that I think about it.) So there are two Charles L. Delaznys and two Carson Colliers mixed up in all this. This shouldn’t add to the chaos at all. While in custody, Enforcer attempts to confuse the police by claiming that he is Carson Collier Jr. His deception is not exposed until he makes his escape. The police are easily confused, it seems. The Enforcer is soon at large again. The police are undetermined if Enforcer is actually Carson Collier yet. I take it back. The police here aren’t confused, they’re just plain incompetent. …So who was the Enforcer? Does it matter at this point? Just another day in the bullpen during the wild and crazy days of 70s Marvel.